The technology group Wärtsilä has been awarded a contract to deliver a combined heat and power engine power plant (CHP) to Dresden, Germany. The facility has been ordered by DREWAG, Dresden’s local utility company, and will be delivered by Wärtsilä on an engineering, procurement and construction (EPC) basis. Wärtsilä will also maintain the plant under a Wärtsilä Guaranteed asset performance solution for ten years, with a five year extension option. Performance targets are determined based on measured data and Wärtsilä guarantees the targets are met and maintained throughout the duration of the agreement. The order was booked in December 2018. 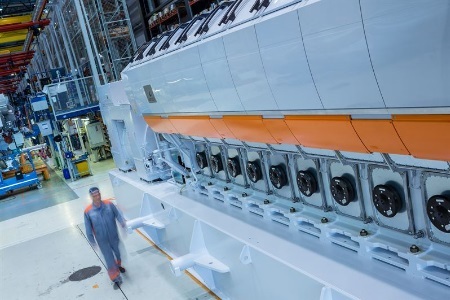 The Dresden-Reick power plant will feature eight Wärtsilä 31SG engines operating on natural gas delivering electrical output of approximately 90 MW. The extremely high efficiency and flexibility of the Wärtsilä 31SG engine were cited as being key factors in the award of the contract. Another major consideration was the ability of the power plant solution to deliver electricity and district heating simultaneously. The Wärtsilä engines can reach full output from start-up in a matter of minutes. This enables them to provide immediate balancing of the grid as the system utilises more and more energy from intermittent renewable sources, such as wind and solar. “The state-of-the-art gas engine technology provided by Wärtsilä is designed to produce minute-to-minute power when it is most valuable. It is equipped with the highest level of efficiency and emission control systems to supply safe, clean, and affordable energy for the state capital for the coming decades,” stated Dr. Frank Brinkmann, Managing Director, DREWAG. The Dresden-Reick plant is scheduled to become operational in 2021. Wärtsilä has in Germany sales and service for marine and energy solutions with offices, workshops and state-of-the-art equipment and technology in nine locations with 1 300 employees. Wärtsilä Energy Business is leading the transition towards a 100% renewable energy future. As an Energy System Integrator, we understand, design, build and serve optimal power systems for future generations. Wärtsilä’s solutions provide the needed flexibility to integrate renewables and secure power system reliability. Our offering includes flexible internal combustion engine-based power plants, hybrid solar power plants, energy storage & integration solutions, as well as gas to power systems. We support our customers over the lifecycle or their installations with services that enable increased efficiency and guaranteed performance. Wärtsilä has 68 GW of installed power plant capacity in 177 countries around the world. For more information, visit www.wartsila.com/energy. Wärtsilä is a global leader in smart technologies and complete lifecycle solutions for the marine and energy markets. By emphasising sustainable innovation, total efficiency and data analytics, Wärtsilä maximises the environmental and economic performance of the vessels and power plants of its customers. In 2017, Wärtsilä’s net sales totalled EUR 4.9 billion with approximately 18,000 employees. The company has operations in over 200 locations in more than 80 countries around the world. For more information, visit www.wartsila.com.